Richard Hardin (left) and Richard Herrera (right) of the Philippines finished in first place during the final leg of The Amazing Race Asia Season 4. They are the first team from the Philippine to win in the Asian franchise of the hit reality show. A team from the Philippines won the fourth season of The Amazing Race Asia. Friends Richard Herrera and Richard Hardin finished first in the last leg of the Asian franchise of the popular reality show from the makers of Survivor. The two Richards, who were both raised in the United States, bested nine other teams, including the other Philippine team—Fil-Australians Jess and Lani, who finished in fourth place. In the final leg, Richard Herrera, a model, and Richard Hardin, a basketball player, went up against the teams from Singapore (friends Claire and Michelle) and Indonesia (father-and-daughter Hussein and Natasha). The race was easily won by the two Richards since they were way ahead of the other teams. The team from Singapore was able to overtake the team from Indonesia and finish in second place after Hussein failed to complete the Roadblock and they were given a four-hour penalty. The two Richards won $100,000 for winning the race. The competition took the 10 teams in a race around the world. The race began in Malaysia and ended in Singapore. In the fifth leg, the teams went to Legzapi, Albay in the Philippines, where the Richards finished in second behind Malaysia's Ethan and Khairie. Overall, the two Richards finished 1st in three legs, 2nd in six legs, 4th in one leg, and their worst finish was in 6th place during the third leg. In the fourth leg of the race in Sri Lanka, the two Richards shaved their heads in the Fast Forward, which allowed them to skip the other tasks and go straight to the Pit Stop. By doing so, they finished in first place. In the four seasons of The Amazing Race Asia, this is the first time that a team from the Philippines won. The Philippines already has a very good record in the race. Last year (Season 3), Tisha Silang and boyfriend Geoff Rodriguez finished in second place, behind the team from Hong Kong. In Season 2, best buddies Marc Nelson and Rovilson Fernandez came in third place. The team from Singapore won. Our worst finish was in the first season, when the two teams from the Philippines—actress Aubrey Miles & model Jacqueline Yu and Ernie and Jeena Lopez—were the first two teams eliminated. The team from Malaysia was the first winner. 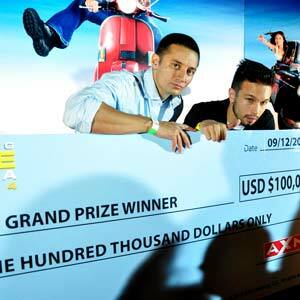 The Amazing Race Asia, aired on cable channel AXN, is hosted by Allan Wu.